When it comes to ranking the largest airlines, the top four U.S. airlines have changed little in the past decade. However, one area of evolution has been the prominence of the ULCC. With Allegiant being the only true ULCC from birth, Spirit, Frontier, and now Sun Country have joined the ranks of ultra low fares, and extra charges for everything else. Yet it is this model of un-bundling that has seen strong growth in the U.S. market. 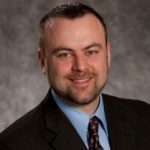 With Spirit and Frontier both experiencing strong growth after switching to the ULCC model, Sun Country hopes to tap into the same growth with their recent transition. While no airlines in the top 10 were ULCCs a decade ago, today both Spirit and Frontier hold that distinction. Allegiant continues to grow as the 12th largest airline in the U.S., and Sun Country begins it’s journey cracking the top 20 in 2016. This chart doesn’t directly show the change in size of the airlines, although it does represent the relative presence in the market. Consolidation has turned medium and small sized airlines into larger airlines who have remained near the top. 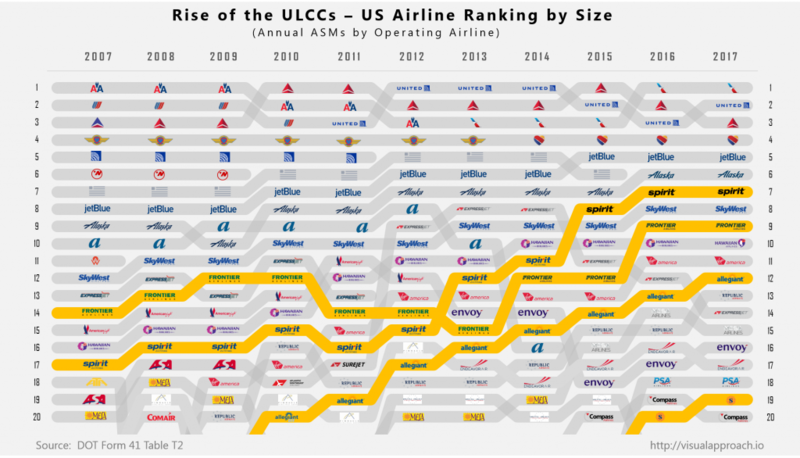 Organic growth has been seen in other traditional LCCs, such as Virigin America and Jetblue, however it is the rise of the ULCCs into prominence that has been the big change in the past decade.